George was born on July 28th 1889, the second son of William and Louisa Bolton. It was about this time the family moved home from Curlew Cottages in Northfield Road, Boveney Newtown, to Clyde Place, a semi-detached house along the main village road and near to the Three Horse Shoes public house. Several times the family moved while George, together with sister Sophie, were growing up. Apart from the Clyde Place move, the other homes were in Boveney Newtown. William, the father, was a butcher by trade and for many years was employed in a corner shop on Windsor's Castle Hill. The shop was complete with its own abattoir at the rear of the premises. For a few years he had his own meat business in Alma Road, Boveney Newtown. This later became a general stores, and was in the Shakespere Place terraced row. Both parents were strong churchgoers: father William attending St. John the Baptist where he was a sidesman, and Louisa attending the Methodist Chapel. Whether George followed his father, or went to chapel with his mother and sister Sophie, is not known. Certainly when he was five years old he attended the Eton Wick Infant School, and at the age of seven he followed the normal village practice for boys, and went to Eton Porny. In 1903 at the age of 14 years he left school for work. It is believed brother Bill became a regular peacetime soldier, although no evidence has been found to suggest George did likewise. In 1915 the family are recorded as living in No. 4 Primrose Villa, Alma Road. If George was not a full time soldier, he certainly wasted no time in volunteering to serve following the outbreak of the war. He enlisted in Slough. The Parish Magazine lists him as serving by September 1914. His unit, 2nd Battalion Oxford and Buckinghamshire L.I., was a regular Battalion and is recorded as landing in Boulogne 10 days after the declaration of war August 14th. Allowing that George was not a peacetime soldier, and consequently would have needed several months training, we will look at the Battalion's service from 1915, by which time it is reasonable to presume he would have joined his unit. His Brigade and Division were with the I Corps in September 1915 and preparing to attack the strong German defences in the opening phase of the Battle of Loos. It took several days to assemble the many Divisions and all their necessary supplies. The attack was planned to commence at 06.30 on September 25th 1915. The Oxford and Bucks L.I. together with the other units in the 5th Brigade were stationed on the extreme left flank and their line of attack was toward La Bassee. It was here the British planned to use chlorine gas for the first time. Over 5,500 gas cylinders had to be moved to the front and this alone involved 8,000 men, all toiling away under difficult and dangerous conditions. Forty minutes before the attack was due to be launched, the gas was released. Instead of the expected wind blowing the gas across No Man's Land and into the German lines, an early morning change of wind blew much of it back into the British trenches. Unexpected casualties hampered the attack. George Bolton was at least spared this, as he was killed the day before. In all probability he was killed during the process of assembling the many thousands of men in the "line" for the early attack next day. Perhaps it was shrapnel, or a sniper's bullet that took his life, but we do not know. 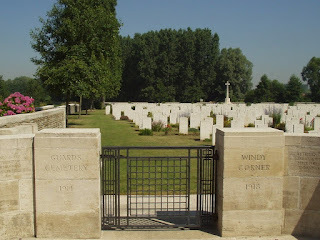 The cemetery .where he is buried is very close to the Battalion assembly point. He was a single man aged 26 years. He is buried in Guards Cemetery Windy Corner, Cuinchy, in France. There are 3,396 graves in this cemetery, and all but 32 are the graves of men from the United Kingdom. Private Bolton's grave is No. 2; Row E; Plot 2. He is commemorated on the family headstone in the south west corner of Eton Wick Churchyard. He is the fourth named serviceman on the Village Memorial and is also commemorated on the Eton Church Gate Memorial tablets. His sister Sophie lived in Alma Road for the rest of her life; she faithfully served the Methodist Chapel and was very well known. She died in the early 1990s. From the cemetery register, CWGC.